Make Magazine’s blog recently featured the Das DereLicht–a QRP transmitter made almost entirely from the electronic components found in within a CFL Bulb. The transmitter, was designed by Michael J. Rainey (AA1TJ) who was inspired while changing a defective CFL bulb in his kitchen. For some reason, I began to wonder if it would be possible to build a QRP CW transmitter using the electronic components salvaged from this derelict lamp. Indeed, I’m pleased to report that a perfectly serviceable transmitter may be constructed! The only additional components required were the quartz crystal, and four of the five components needed for the output lowpass filter. The resulting transmitter produces up to 1.5 watts on 80m. Michael, thanks for creating such a cool, simple, little QRP project. 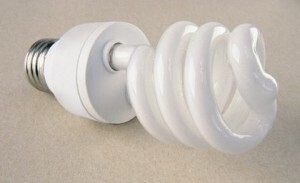 I’m ready to (carefully) tear into an old CFL bulb and give it a try! This entry was posted in Articles, Homebrew, Websites and tagged AA1TJ, CFL, Das DereLicht, Homebrew, QRP, QRP Projects, Transmitter. Bookmark the permalink. Just updates them–should work now! I tried to add a comment but it failed to post. Pity! Sorry about that, Bry. I’ve had some quirky issues going on with the blog since we upgraded PHP to version 7. Yes–it appears they’ve moved or removed the site.